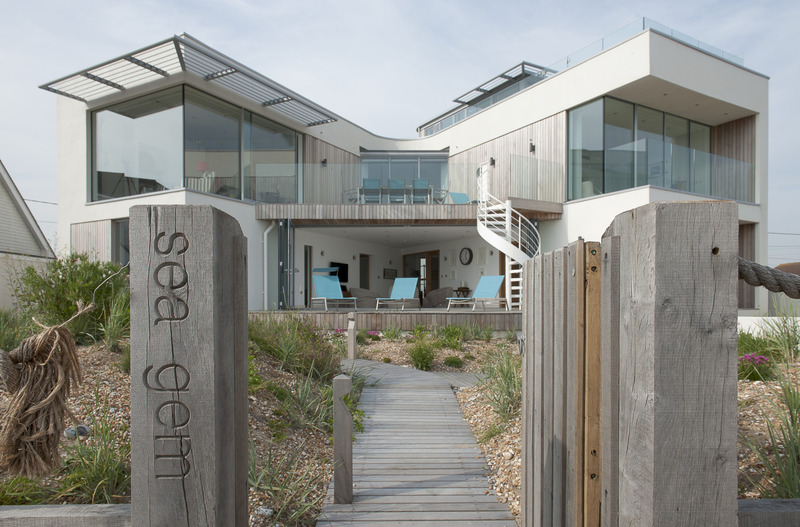 Sea Gem is aptly named and a Modernist treasure. 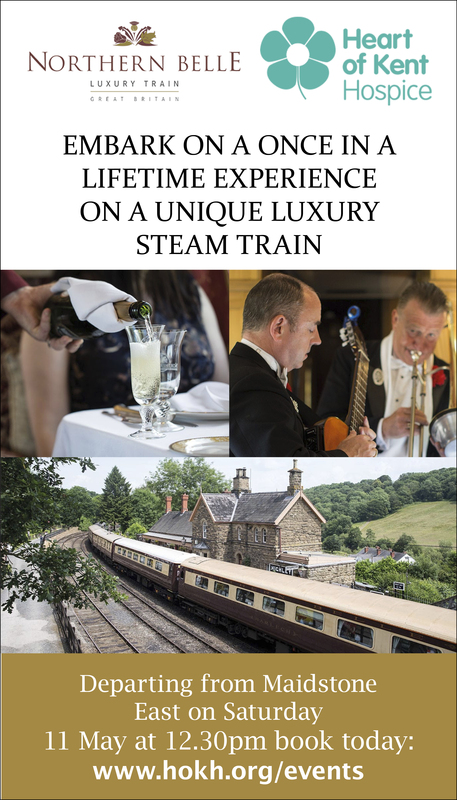 It echoes the style of 1930s English seaside architecture but is no imitation or pastiche. 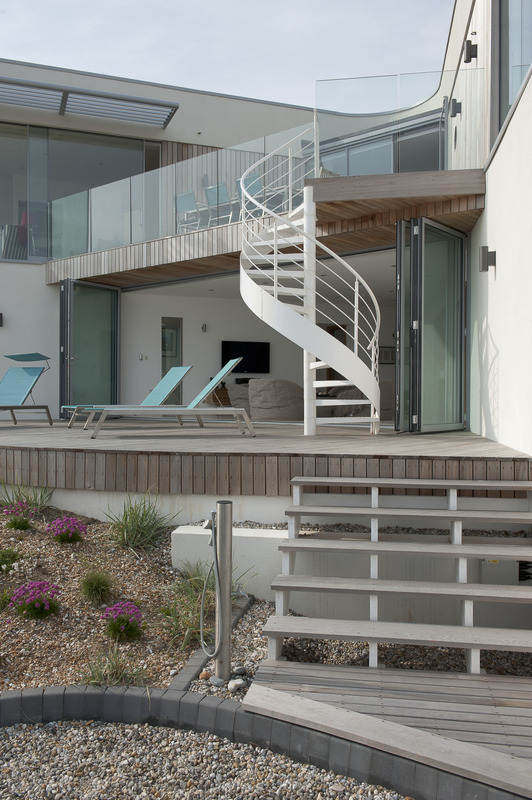 The angular forms and spiral outdoor stairs, reminiscent of an ocean liner, have the elegance of art deco, but apart from the cedar timbers, the materials that it has been constructed from are very much of the 21st century. With its vast planes of glass, it looks wonderfully open and perfectly designed to absorb the unique coastal light, and yet its unusual form hints at a more complex, intriguing building within. Being offered the opportunity to explore Sea Gem and write about it was an irresistible invitation, but would it live up to expectations? Arriving from the landward side, the ‘rear’ of the building did not disappoint. The curved wall and roof ‘turret’ strongly resembles a lookout or funnel on a luxury cruise liner. It recalls the buildings of Wells Coates and its 1930s-style steps lead up to a main door that feels surprisingly understated. 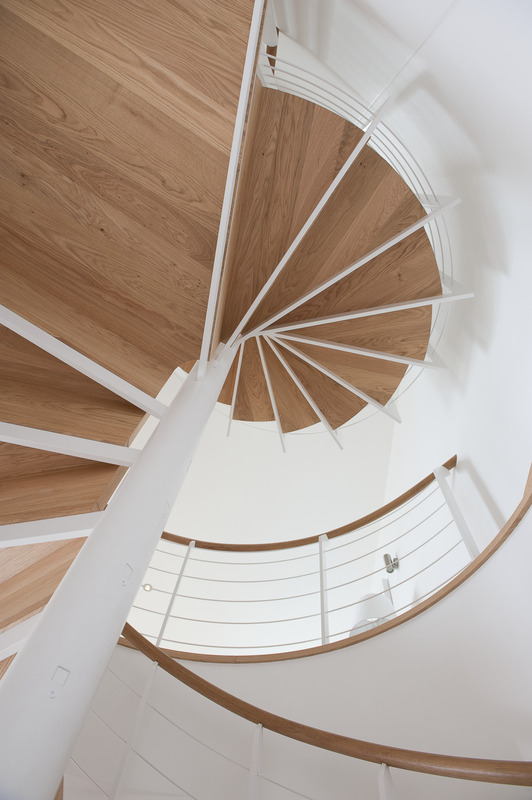 When Michael, Sea Gem’s owner, opens the door, he swiftly leads the way to the internal spiral staircase and looking up, as we climb, it strikes me that the stairs look like the cross section of a nautilus shell. 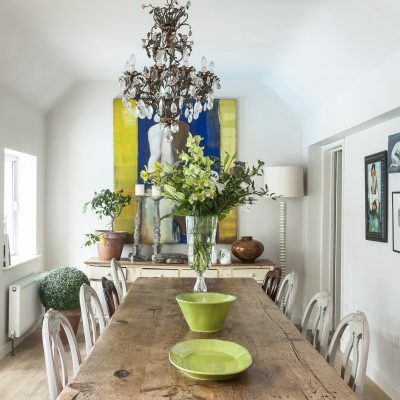 We step out into the first floor living quarters, and pass a long oak dining table surrounded by chairs covered in varying shades of blue family-friendly fabric. 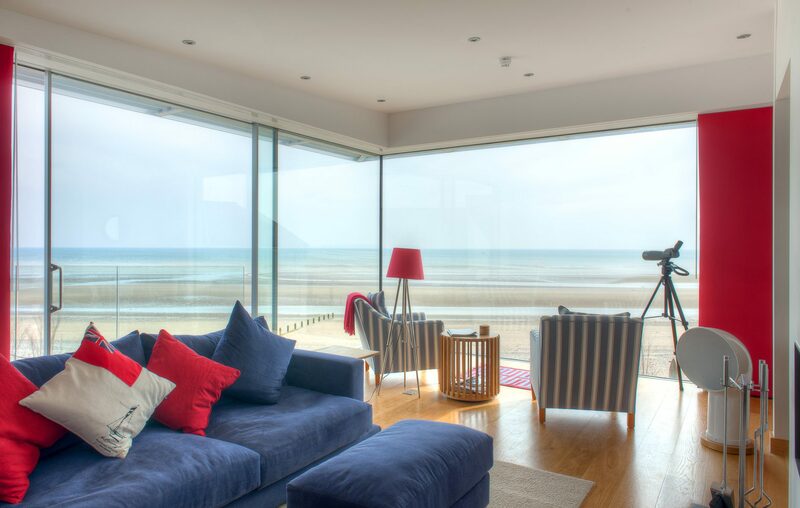 As we move further into the large open-plan space the impact of the view is so arresting that it is responsible for a brief lack of manners on my part as I stand and gaze across miles of beach and sea. Michael waits patiently for me to recover my social skills, as if this reaction is a common occurrence among visitors. His wife, Jill also smiles forgivingly. 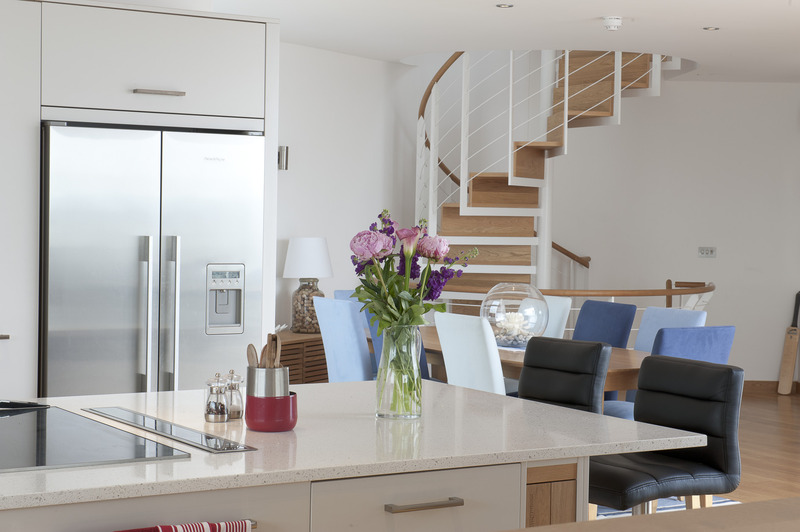 The kitchen area, where she stands, is sleekly efficient in appearance, with simple white cupboards and stainless steel appliances. 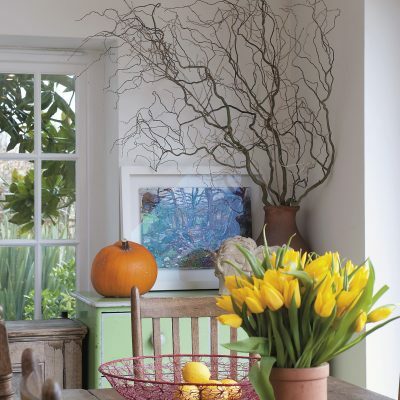 The effect is softened and warmed by the presence of vases of summer flowers and a red enamel bread box, toaster and storage canisters. The worksurface on one side of the kitchen provides a divide between this and the living area where a navy blue L-shaped sofa is dotted with red, ecru and blue cushions. There is a triptych of oil paintings depicting sailing boats on a deep blue sea that was painted for Jill and Michael by Delphine Pope at the Strand Quay Gallery in Rye. Deep wooden shelves are filled with board games for rainy days and there is a wood burner set into the wall for when it’s colder still. Two walls of the room are of floor-to-ceiling glass, although one of these slides open to allow access to the decked terrace. The corner is free of a supporting column, so the glass seems to ‘wraparound’ the building, allowing uninterrupted views of the beach. 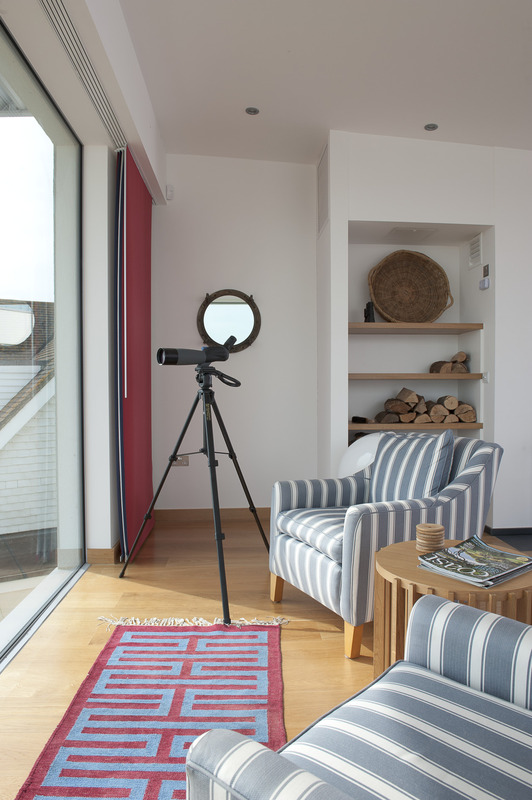 Looking straight out to sea, two striped armchairs have been placed with a smart scarlet shaded chrome tripod lamp and a telescope within reach. The shallow pools of water left behind on the low tide give the beach horizontal stripes whose colours alter every few minutes as the clouds scud across the vast grey-blue sky. Despite the cloudiness of the day, the house feels wonderfully warm. “Of course, at times, it can feel rather too warm until we open the doors, but if we want to keep out the sun, or simply want a little more privacy, we can draw the blinds across it,” says Michael as he deftly pulls red and blue panels of stiffened canvas across the glass as if he is setting the sails on a yacht. “The interiors of the house were all designed and managed brilliantly by Caroline Robinson, and this was one of her ingenious ideas. 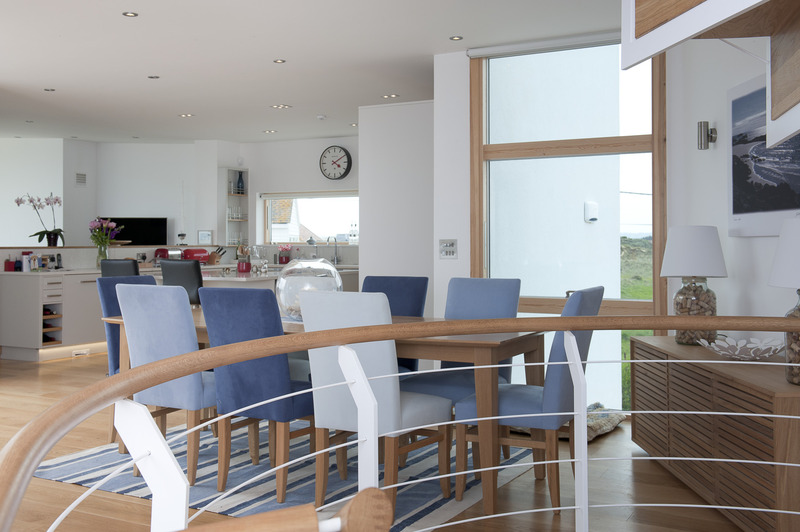 We also put similar blinds above the folding doors from the dining room to the upper terrace because in the winter and at night, you often want to feel cosy when you’re eating. 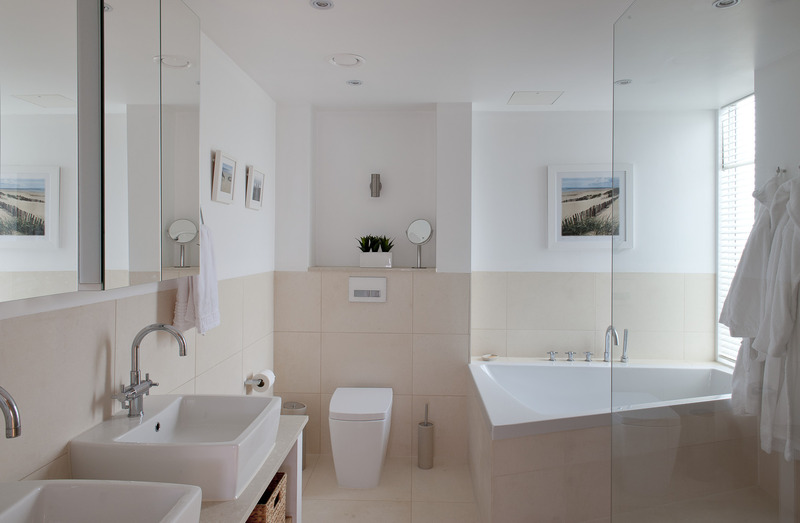 We love the glass during the day, but it can feel a little stark if you don’t add warmer touches. 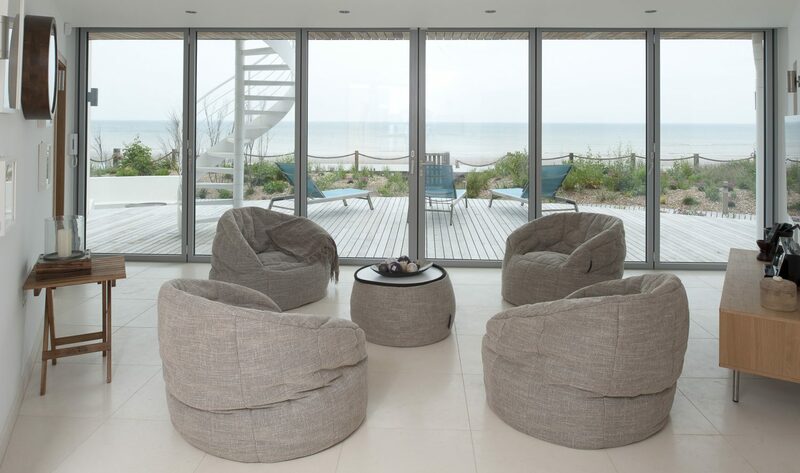 This house is fabulous for entertaining, but is quite different to what we had originally envisaged a beach house should be. “We started coming here with our children about ten years ago and always loved the beach,” Michael recalls. 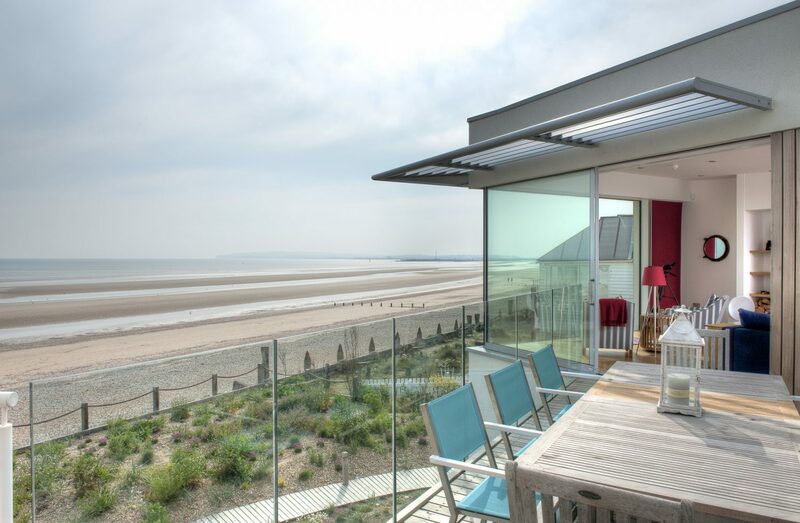 “Then about five years ago, we began to think about buying a house on the coast, and at first we looked at Devon and Cornwall, but I always thought that Camber Sands was the finest beach on the South East coast and it just kept drawing us back. We have friends in Rye too, which is such a lovely town with fine tennis and golf clubs that it, too, was a great attraction. 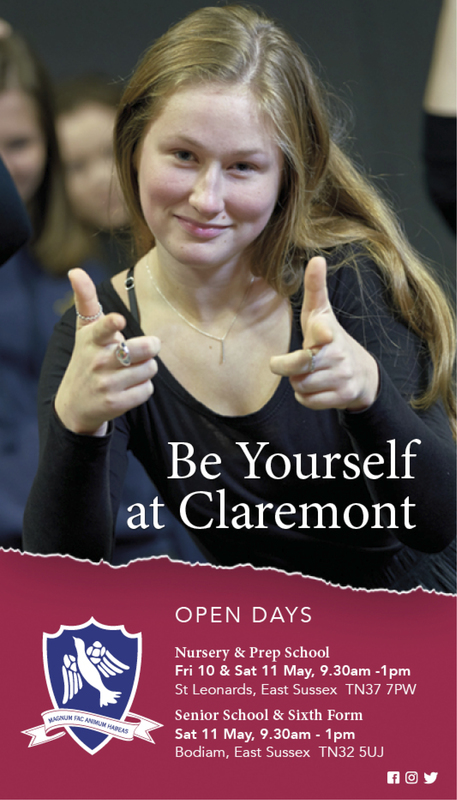 The problem with Camber, though, was that there are relatively few houses that are actually on the beach – which is great, actually, if you live here, but they tend to stay within families and be passed on from generation to generation, so that it is really difficult to buy one. “I kept looking for a plot to come up for sale and then in desperation and without much hope of success, I put notes through a few letterboxes. To my surprise, an elderly couple replied. Their full-time residence was quite some distance away and so it was a long journey every time they wanted to come to the beach. It took a while before they felt comfortable enough to sell, but eventually we bought their bungalow. It was a sweet little place and at first we were very tempted to keep it and just build onto it, but it had no proper foundations and no insulation. We realised that it would be more sensible to build something new and so plucked up the courage to knock it down and begin from scratch. “I was then going to start the search for an architect but a friend of ours from Rye, Chris Pack introduced me to James Robson, an architect based in Tunbridge Wells. I gave him a kind of wish list of features and originally thought the house should be in a sort of New England/Hamptons style, but James pointed out that to maximise the views of the beach, the house would need lots of glass and a more traditional weatherboard house couldn’t deliver that. When James came up with this design, I was a little taken aback at first, because it seemed to be more of a statement than I’d intended, but I also realised that it could be something really special. The building is based around a V-shape which makes the most of the panoramic view but also provides natural shelter from the wind. We found a great set of contractors and our friend Chris Pack acted as an excellent clerk of works, whilst Baxall Construction, the builders from Paddock Wood were brilliant. 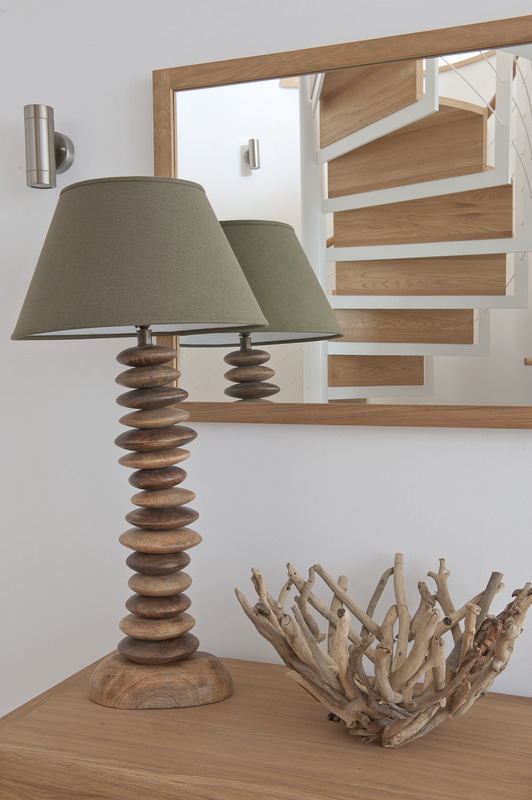 We wanted something modern, with a nautical theme, but the building also needed to be sustainable and efficient to run. We have underfloor heating that is powered by an air source pump, which although it is expensive to install, should be very efficient, cheap to run and eco-friendly. 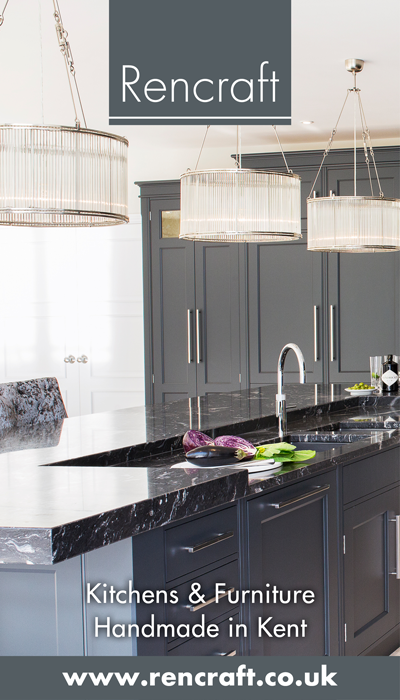 When I met Malcolm Clarke, Baxall’s MD, he understood what we were trying to achieve straightaway and the site manager, Troy was just fantastic. We were concerned to preserve good relations with our neighbours and Troy was really good at that because there was a stage in the build when it looked really hideous and lots of local people must have wondered what on earth they would end up with. 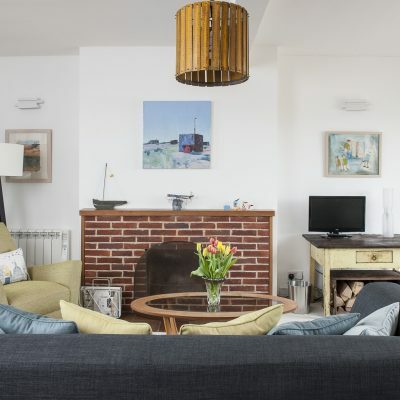 We are fortunate to have really great neighbours and Julie and Mark who live right next door look after the lettings for lots of the houses along this stretch of beach, so we’re pleased that they also feature Sea Gem on their website too. 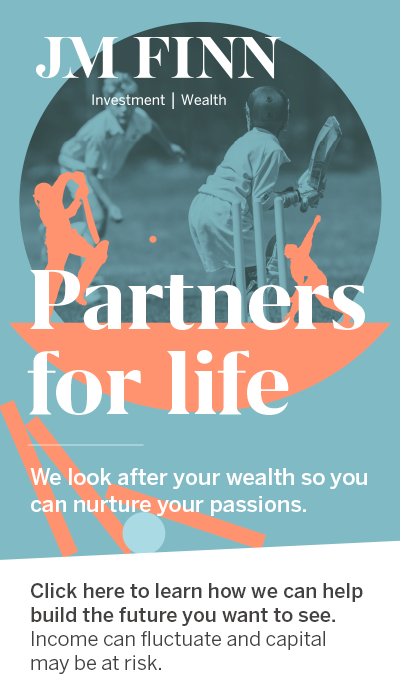 We plan to let it from time to time for people who want to holiday here, but we have also been approached by a couple of locations agencies too. We’re naturally quite private people, but we also realise that this house doesn’t just blend into the background, so people will be curious about it. Stepping out onto the first floor terrace, there is a wooden dining table and turquoise chairs that echo three sunloungers on the ground floor deck below. The barrier up here is made of toughened glass so that again, the view is uninterrupted. 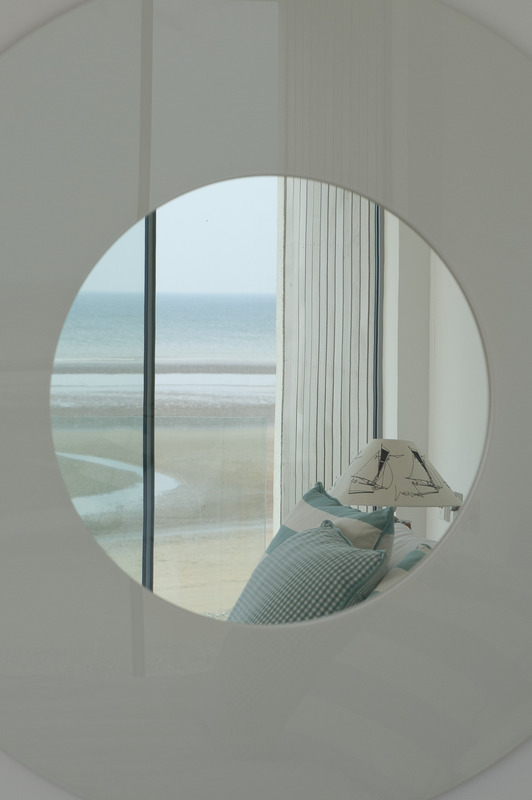 A small ‘porthole’ style window looks through into the dressing area of the principal bedroom. This room also features floor-to-ceiling glass and some special curtains that are remotely controlled to run on an electric rail and, when unused, are discreetly housed behind a false Pocket Wall. This clever design screens the curtains when not drawn, without obscuring the perpetual panoramic sea views. 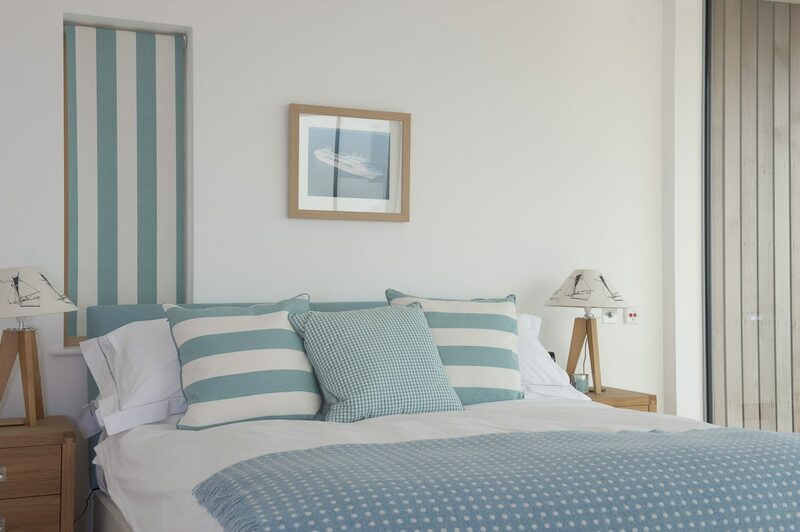 The room is clean and uncluttered and has a sea green bedcover and striped cushions that complement rather than compete with the colours of the waves outside. 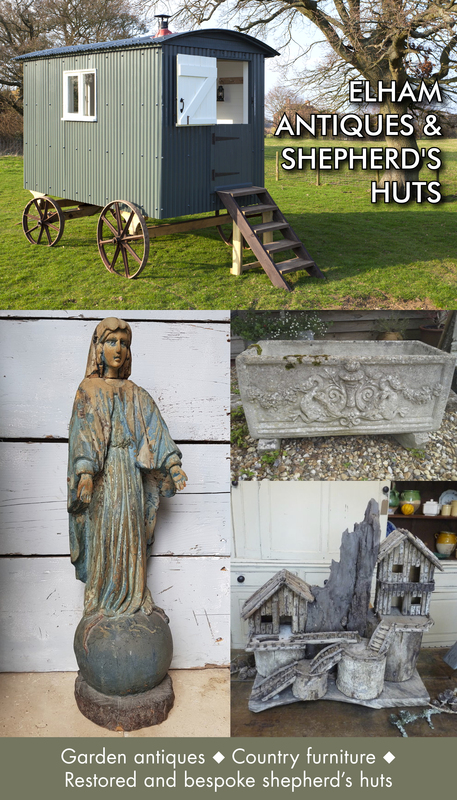 There are twin bedside tables, a large circular mirror on the wall facing the beach, and a pair of white linen covered chairs, but otherwise, furniture has been kept to a minimum with the built in cupboards and drawers of the dressing area constructed by Hugh Ashford a local joiner. Up the staircase again to the top floor, we enter the couple’s office. 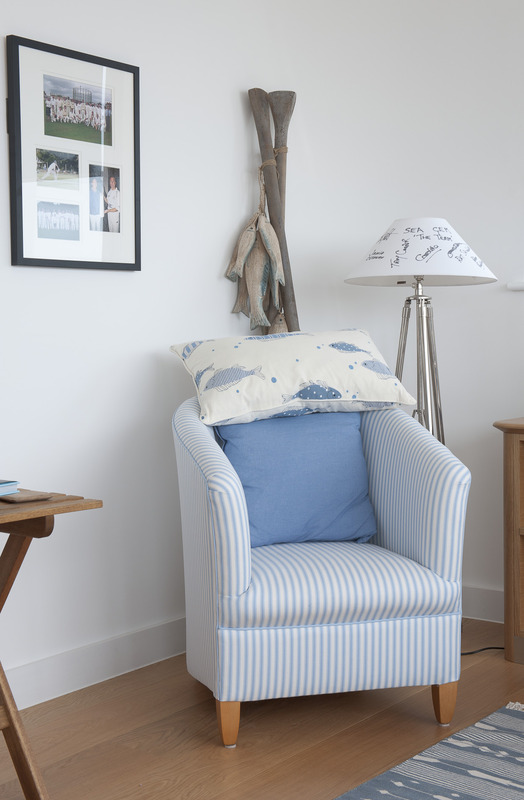 One wall is curved with tongue and groove timbers painted in a soft powder blue. There are two oak desks, one facing inland and another out to sea, but Michael admits that the expanse of sky and sea has often proved too distracting, so he has recently had to install blinds. There is another terrace on this level, too, and there are plans to plant it up with some simple greenery. We descend the stairs again to the ground floor, where there is a series of guest bedrooms, each with its own bathroom. The laundry room is tucked away here too, and another hallway and side door opens onto the garden. “This is designed to try to keep the sand out of the rest of the house and we have French beach shower stations outside so that we can clean off before we come in,” adds Michael. 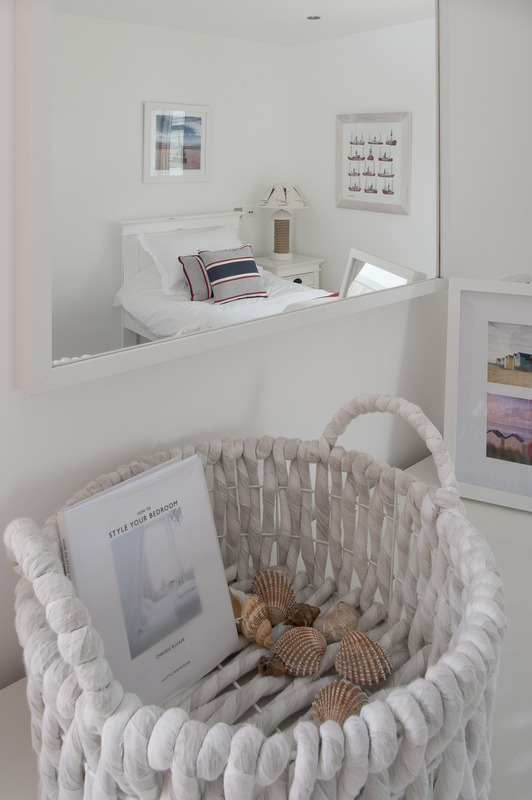 There are children’s fishing nets and wellingtons ready for visitors to use and a well-stocked towel cupboard. 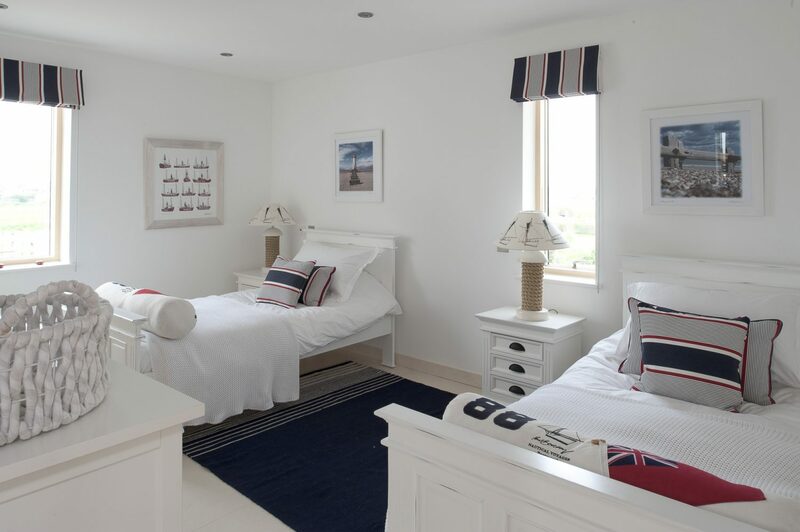 The east corridor leads to a twin bedroom with white sleigh beds, knitted covers and red, white and navy blue striped blinds and cushions. 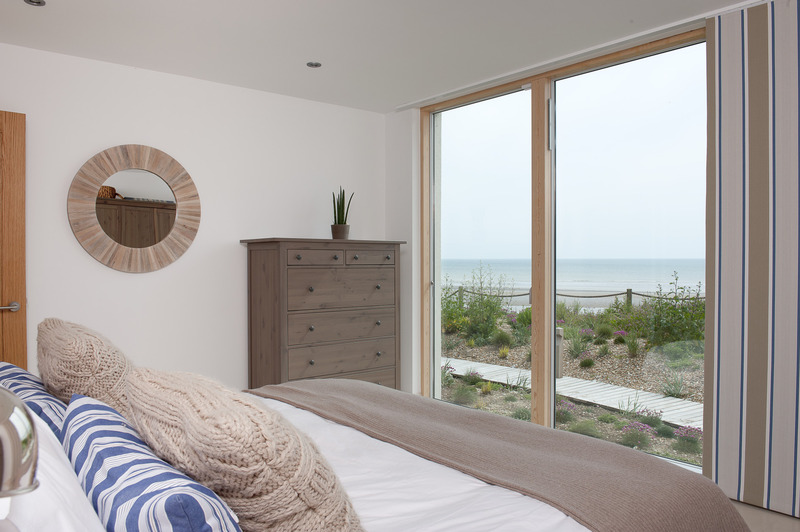 Beyond it and facing the sea is a double guest room decorated in softer shades of taupe, ecru and slate blue. The other wing of the V-shape has another guest room and private terrace. 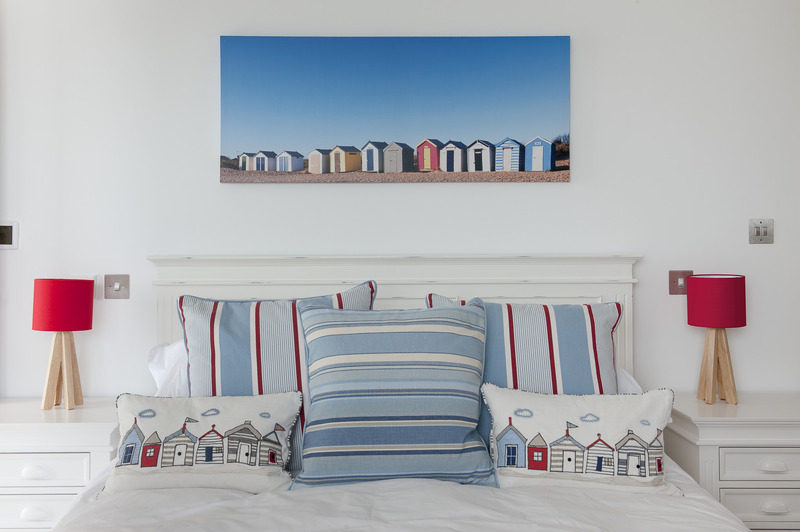 The bedroom is again decorated in Sea Gem’s signature nautical colours, with bold, sky blue and scarlet stripes set against pure white bedlinen. On the wall above the bed is a vividly coloured wide angle photograph of painted beach huts, one of several similar pictures in the house by Gill Copeland and bought in Rye. 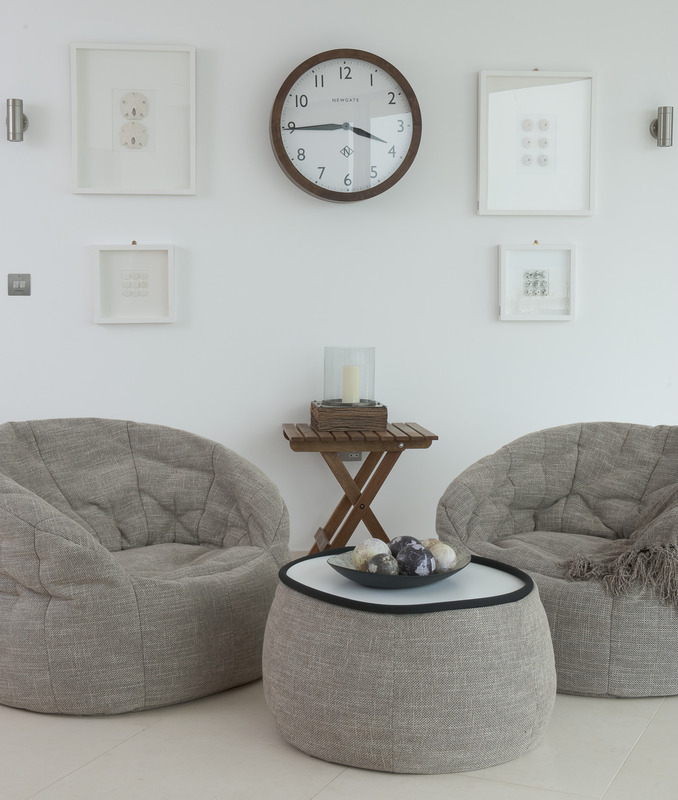 The reception room on this level was intended as a games room but again, its access to the beach makes it hard to concentrate on much else. 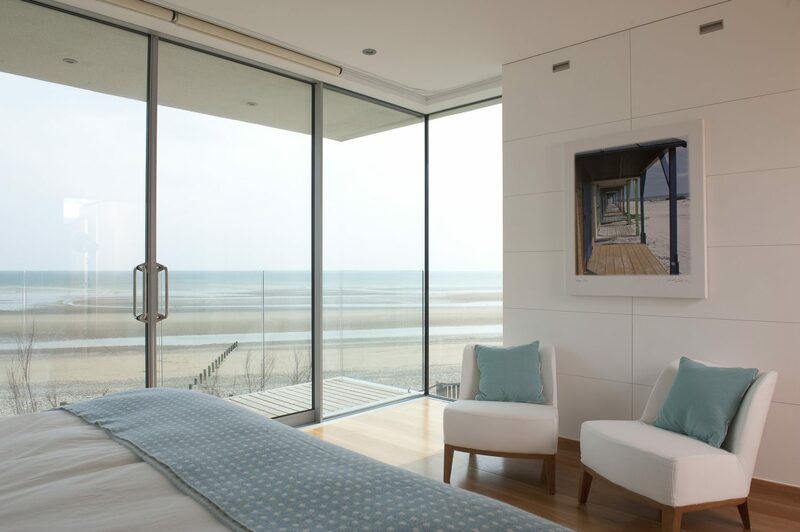 This room forms the V-shape at the heart of the building and the outside ‘wall’ is in fact a series of glass doors that completely fold back to open the room to the sea breezes. Stepping out onto the deck allows a proper inspection of the garden that has been designed by Jo Thompson, who is based in Kent and has recently created an award-winning garden at Chelsea Flower Show. At the far end there is a sea defence with timber uprights linked by rope made at Chatham Dockyard. There are gently undulating mounds where the planting is very much an extension of the dunes that surround the house and includes grasses such as Letymus (wild rye) and Marram as well as flowering Sea Kale. 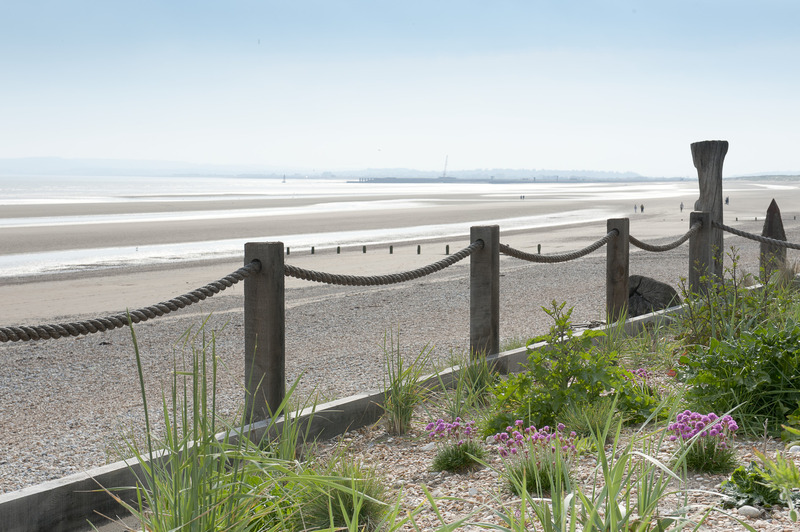 The plants were chosen in association with Natural England so that they would complement the beach and dunes that are classified and protected as a Site of Special Scientific Interest (SSSI). 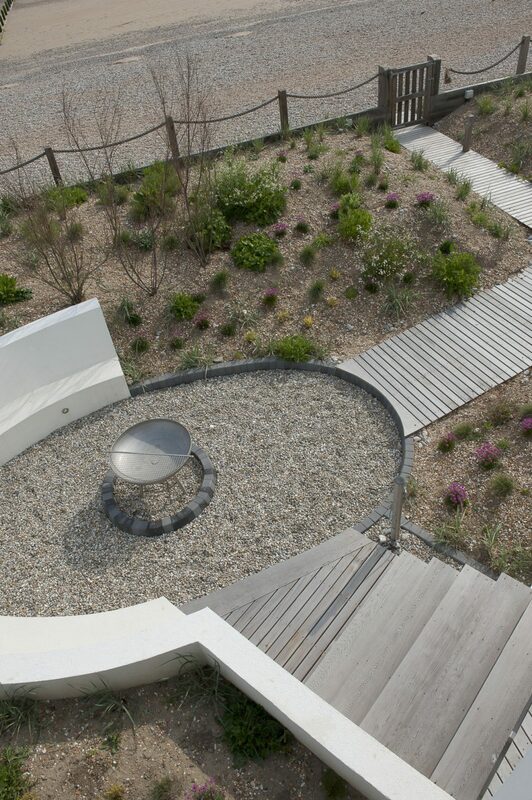 Curving wooden boardwalks snake through the grasses and a fire pit is surrounded by a sunken area of seating that is invisible from the beach and so offers both shelter and privacy. Looking back at the house from here, it seems to resemble a huge pair of binoculars, or a collection of viewing boxes with which to take in the sight of one of the best beaches in England – whatever the weather.